We are presenting two of our favorite bands and a new Bluegrass sensation from Austin Texas Thursday May 7th at the Charleston Music Hall. 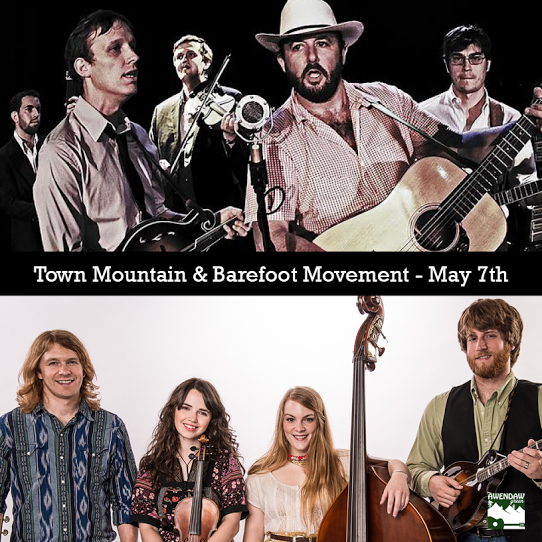 Town Mountain and The Barefoot Movement with special guests Bottom Dollar String Band. Awendaw Green wants to bring more music to the Hall and we need your help. Thanks for your support and please share this show with your stringed music loving friends. The sound of the award-winning group Town Mountain can best be described as traditional bluegrass, albeit with a rough-hewn side to it that is not too slick or glossy. They are a band of the here-and-now, yet they have a groove that is based on the bluesy and swinging sounds explored by the first generational bluegrass pioneers of the last century. With the success of their latest album, Leave the Bottle, the word is out with some of their best reviews yet. Bottom Dollar String Band is cutting a new path in contemporary bluegrass music. Entertaining audiences of all ages since 2011 they are earning a reputation for fusing old time instrumentals with contemporary bluegrass and beyond!